Vandy Vape is back again, a new 24mm dual coil RDA, which is also able to be used in a single coil configuration. The Capstone RDA gets its' name from the post design, resembling the top of a pyramid (i.e. the capstone), this rda features an amazingly innovative squonk design, comes included with an extra top cap, and delivers a truly unique vaping experience. Squonking is no longer the new novelty that it used to be. From raised pins, squonking from above vertical coils, etc. this trend has hit somewhat of a wall lately for innovation. Luckily, Vandy Vape has brought us this waterfall-like squonk action that certainly threatens the old ways of squonking. The E-Liquid is channeled from the build deck directly to the top of the coils and distributed evenly over the wick. This design allows your coils to saturate quicker and more efficiently. The two different top caps included offer different functionalities. The primary *metal* top cap features a trapezoidal shaped airflow adjustment that truly allows you to direct the airflow where you need it to be on the coils, as well as features a single coil airflow option. The frosted top cap is the "Comp Cap" made specifically for those huge clouds. 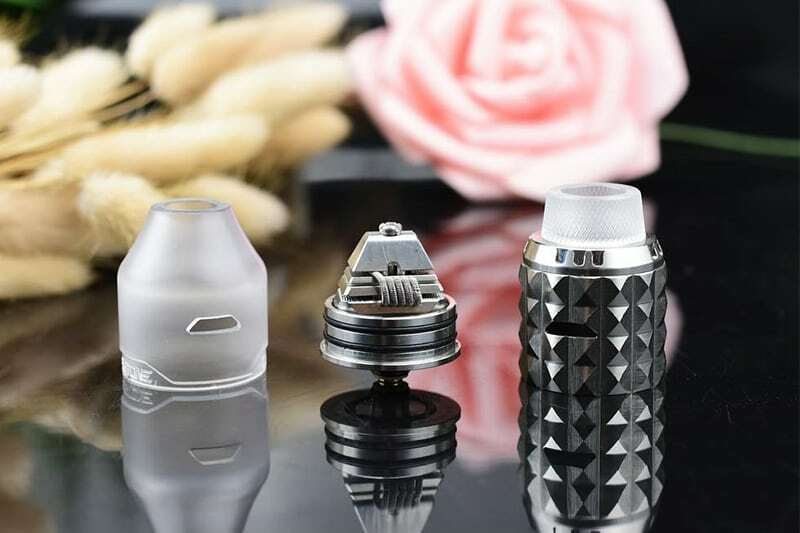 Overall, the Capstone RDA is what we've come to expect from Vandy Vape. Meticulous machining, paying close attention to detail, smooth threads, and great resistance / seal from o-rings. The Capstone RDA does not fail to meet the standards that Vandy Vape has set with their previous products. The deck features a very cool pyramid shaped build post that is spring loaded. It is an extremely easy to build on deck that, while seems large to the eye, truly helps in the form of flavor density produced. The RDA comes included with a coiling tool that helps you measure the length of the leads you need for your build. Something tells me that this little accessory may hit the big leagues, as we may start seeing such a userful tool in future RDA's across the market. This little accessory is an amazing tool to have. This atomizer is fantastic. From the build quality, ease of use, to the flavor - I have yet to have any complaints about this device. I have been using it since I received the sample from Vandy Vape about 2 weeks ago. Through the probably 10 different builds I have had in it, using it on standard regulated mods, mech mods, and squonk mods, this RDA is a great contender with the other top RDA's out there currently. Though, I do admit, you're going to want to keep it on your Squonk mod. The airflow options, flavor density, and that extra lead measuring tool really sell me on this atomizer. Vandy Vape has hit it out of the park again! The Capstone RDA by Vandy Vape is an innovative RDA that truly holds its' own in the squonk market. If you've found your way to the Squonk Side, then I assure you, this RDA is a must have. From the meticulous and detailed machine work, overall quality is immaculate and this RDA will be in your rotation for the foreseeable future.